After several groceries closed in their community, this community organization needed to understand where food access was lacking and who it affected. SAVI trained Kheprw Institute staff, using SAVI data and GIS software, to find areas lacking food access and the demographics of those communities. 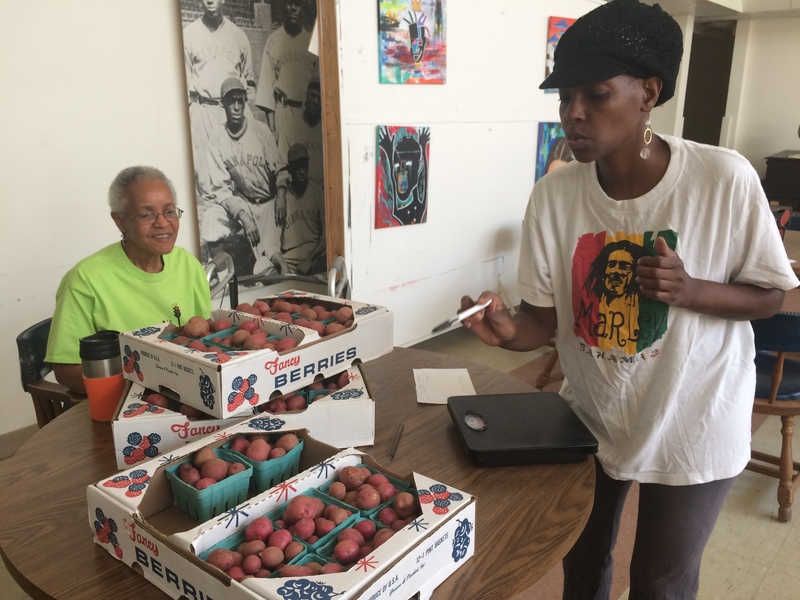 From left, Betty Cowherd and Tysha Ahmad, organizers of the Community Controlled Food Initiative. How do you create positive change in neighborhoods where it’s a struggle to access even basic resources? That’s the dilemma facing the Kheprw Institute (KI), a community-empowerment and youth development organization based in the near-northside of Indianapolis. Its solution is to build relationships and a knowledge base that—multiplied by time—add up to real community-changing power. In 2016, for example, some of the neighborhoods that KI serves lost their last two grocery stores. KI responded by starting the Community Controlled Food Initiative (CCFI), which connects local farmers with people looking to buy fresh produce. On the second Saturday of each month, KI hosts the Good Food Feast, a “community celebration” where people enjoy a potluck meal, mingle, watch a cooking demonstration, and pick up their food. That kind of program doesn’t just happen. It results from a deep understanding of the area, strong relationships with residents, and a culture that values informed analysis as a catalyst for change. SAVI was an important tool in helping KI put it together by supplying data about the neighborhoods affected by the grocery closings. CCFI’s coordinator, Mimi Zakem, and a group of other young people involved with Kheprw took part in a SAVI training in the early stages of launching the initiative. 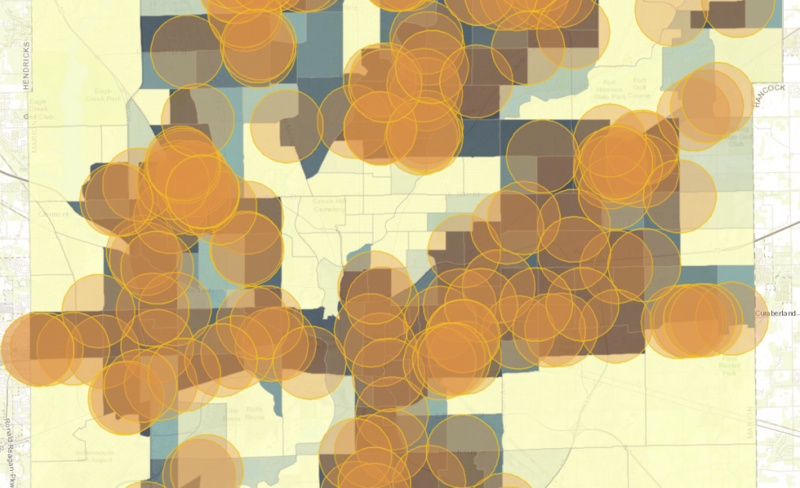 As part of that training, they mapped the problem of food scarcity by zip code and demographics. “It helped us be very clear about what we need to be doing to address the problem of food access, if we’re really trying to come up with a model that works and can be useful for others,” Zakem says. CCFI recently celebrated its second anniversary and serves about 50 people each month. It’s a very partial answer to the problem of food scarcity in the city, but it’s a promising start. The scope of KI’s work extends far beyond food. It is also deeply involved in environmental justice and economic development issues. One of its key strategies is to bring together people in forums to discuss issues that affect the community. Each month, for example, it hosts the Environmental Justice Assembly, where locals share updates about what’s going on and make a plan of action. These forums have produced some successes recently. Notably, Kheprw and a coalition of other local organizations have spotlighted an area of the northwest side where the groundwater is contaminated. The Indiana Department of Environmental Management is tasked with cleaning up the site. The coalition is monitoring its progress to ensure that it follows through. Kheprw is in the early stages of collaborating with local institutions on other water-quality projects. It also contributes to Indianapolis’ climate change action plan, and it’s a partner with the Polis Center in studying gentrification in the city. SAVI’s contribution varies from project to project. But in each case, Kheprw’s mission is the same: To translate relationships and knowledge into concrete action and positive change.